PPHS junior Sydnee Moore (right) takes the baton from teammate Allison Henderson during the 4x200-meter relay held at the Point Pleasant Open Meet on April 17 in Mason County. PPHS senior Alex Gibbs attempts a throw during the shot put event held at the Point Pleasant Open Meet on April 17 in Mason County. POINT PLEASANT, W.Va. — Despite the cooler temperatures, the competition was heated between several area track and field programs. The Point Pleasant boys and girls earned first and third-place overall team finishes on Tuesday night during the 2018 Point Pleasant High School Open held at the Ohio Valley Bank Track and Field in Mason County. The Black Knights came away with seven event titles and 17 top-four efforts en route to posting a score of 100 points. The Lady Knights scored 57 points, winning three events along with 10 additional top-four finishes. Luke Wilson led PPHS with a pair of winning efforts in the 1600-meter run (4:57.81) and 3200-meter run (10:30.35), while Jesse Gleason was the shot put champion (44-6) and captured second place in the discus throw (128-2). Cason Payne finished first in the 200-meter dash with a time of 23.66 seconds, while Joshua Wamsley captured third place with a mark of 24.61 seconds. Zac Samson posted a championship effort in the 400-meter dash (56.43), while teammates Brady Adkins took second place (57.38) and Garret Hatten captured fourth with a time of 57.93 seconds. Hatten also earned a fourth place finish in the 100-meter dash (12.64). The boys 110-meter hurdles provided two top-four finishes for PPHS, as Kaydean Eta (17.72) took second place and Logan Southall captured the fourth spot with a time of 19.20 seconds. Eta also finished second in the 300-meter hurdles (49.80), while Southall added a second place finish in the high jump (5-4) and third place effort in the long jump with a distance of 16 feet 6½ inches. The boys pole vault event produced two top-four finishes for the Black Knights, as Steven Trent (10-6), Nazar Abbas (7-0) and Zach Rediger (6-6) finished in second, third and fourth place, respectively. Rediger also posted a pair of top-four efforts, with a third place finish in the 300-meter hurdles (49.95). Alex Gibbs (41-4) and Trevon Franklin (39-8) also placed second and third, respectively, in the shot put event. Gibbs also added a fourth place effort in the discus (115-2), while Aiden Sang rounded out the top-four individual finishers for the PPHS boys team with a distance of 16 feet 4½ inches in the long jump event. The quartet of Jovone Johnson, Wamsley, Payne and Trent placed first in the 4x100m relay (46.78), while the 4x110m shuttle hurdles relay squad of Brady Adkins, Eta, Southall and Rediger finished first with a time of 1:07.55. On the girls side of the meet, Sami Saunders led the way with a pair of winnings efforts in the high jump (5-2) and pole vault event (9-6). Saunders also captured second in the long jump with a distance of 14 feet 1½ inches. Grace Allensworth also produced a championship effort in the shot put (30-9), while Tegan Hay earned a pair of second place finishes in the 100-meter dash (13.46) and 200-meter dash (28.33). The girls 400-meter dash event featured three top-four finishers for the Lady Knights, as Madison Hatfield (1:06.72), Allison Henderson (1:07.05) and Desiree Bailes (1:14.63) placed second, third and fourth, respectively. Henderson also finished second in the 800-meter run with a mark of 2:41.44. Klarissa Plants added a third place finish to the PPHS girls team effort in the long jump with a distance of 11 feet five inches. Hanna Gleason concluded the Lady Knights individual top-four efforts, as she finished second in the shot put (29-03) and third in the discus throw (73-5). The Point Pleasant girls team also captured second in the 4x100m relay (57.28) and 4x200m relay with a time of 1:59.78. The Hannan girls came away with a fifth-place showing with one overall point, while its boys squad captured fourth with two points. Lady Wildcats senior Cassidy Duffer finished fourth in the discus throw (72-2) on the girls side of the meet, while Jordan Fitzwater finished third in the boys 110m hurdles event with a mark of 19.15 seconds. The Ohio Valley Christian girls team took fifth overall with two points, as Chasity Deckard finished in fourth place in the 100m hurdles (21.43) and the long jump event with a distance of 11-3¼. 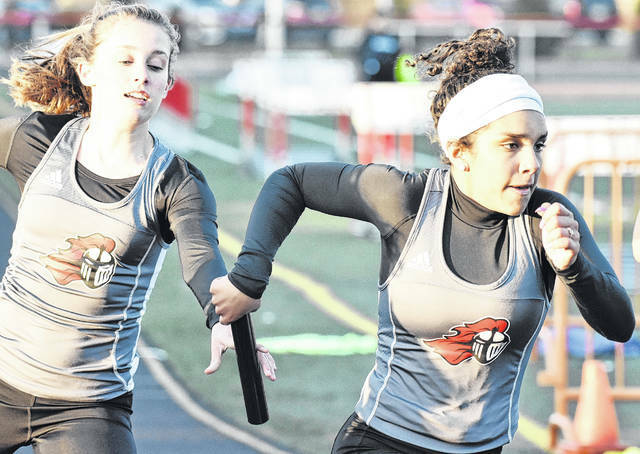 PPHS junior Sydnee Moore (right) takes the baton from teammate Allison Henderson during the 4×200-meter relay held at the Point Pleasant Open Meet on April 17 in Mason County.